Last week I took a nice long bicycle ride through Tinley Park Forest Preserves with a friend. Before we left, I slathered on sun screen all over my arms and neck and face. 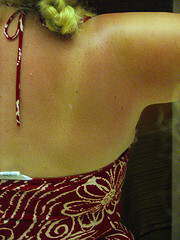 Unfortunately, I wore a tank top and did not get enough sunscreen on the back of my shoulders. Of course, I got a nice red sunburn on my shoulders that looks like cap sleeves! Avoid sunburn this July 4th with ample sunscreen. However, if you do get sunburn, follow the tips below to help ease the pain and aid the healing. My number one treatment for sunburn (aside from getting out of the sun!) is Aloe Vera. I use a brand that is 99% aloe but the aloe from an actual plant is even better. (Perhaps it’s time to add an Aloe Vera plant to my urban porch garden.) Yahoo Health has some other home remedy ideas like vinegar compresses, backing soda compresses, and whole milk compresses here. The article also mentions foods, creams and vitamins to help you heal the sunburned skin. Remember that sunburn is an actual burn of your outer skin. Skin is your bodies first line of defense in avoiding infections, repelling harmful substances and protecting your muscle tissue. Therefore, drinking enough water, keeping the burned skin hydrated, and keeping your immune system strong all helps you to heal from sunburn. Once you heal from your sunburn, the next time you go outdoors, make sure your sunscreen is applied EVERYWHERE your skin may be exposed: hands, back of your neck above your collar, back of your arms and shoulders, on the tops of your feet if you wear sandals. It’s those places that are most often exposed to the sun, but are easiest to forget when applying sunscreen. Use a spray on suns screen if you have a tough time getting to your back and neck or if you don’t have anyone nearby to help you apply it. (Just apply in well ventilated areas and don’t breath the spray-it’s only for external use not inhalation!) And if you sweat, even with “sweat proof” sunscreen, make sure you reapply sunscreen every few hours. Your skin will thank you by not getting red, painful and itchy from sunburn! MyBodyZone has a list of 33 tips on buying and applying sunscreen here. The article explains UVR and SPF in-depth and also provide much health information about the ingredients in sunscreens. In addition to avoiding sunburn pain, being safe in the sun is a good way to reduce your risk for skin cancer, natch! And finally, when it comes to prevention of melanoma, who better to advise you than the American Melanoma Foundation. They have an easy to read set of tips about SPF and sunscreen here.